Oh burn. 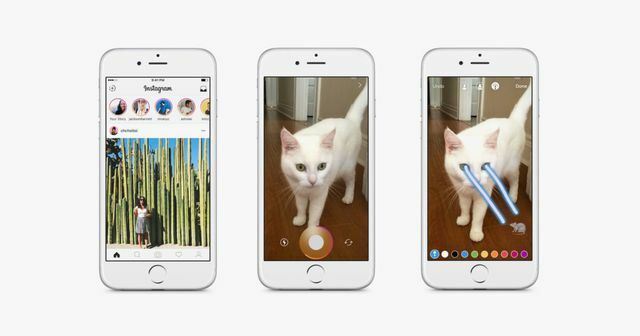 Instagram has stepped on Snapchat's turf and introduced Instagram stories. It is virtually the same idea as Snapchat stories - a 24 hour post that disappears. I think this could really take off (I haven't used it yet, so this is my theoretically point of view at the moment). But if we look at the numbers Instagram has 400 million active users and is expected to grow 15% this year. Offering new features and constant updates, following Facebook, will keep the platform fresh and keep those users coming back. If Instagram is offering a very similar thing to Snapchat, just in slightly different packaging, why wouldn't users flock there. Instagram's editing features also tend to create much more visually appealing shots. Then there is the convenience factor. We use so many different sites and apps and usually various log-ins for them, having two of those apps in one could be very easy to use and access for some of Instagram's target market. Sure, not all copy cat ideas work. But I think Snapchat should be a little worried. Will this new feature see users migrating from the network altogether to go to Instagram? And let's not forget Facebook owns Instagram. The huge beast just keeps on growing. If there’s one unassailable truth of this ouroboros of innovation, it’s that everything that’s social must converge. That’s just the way the constant pursuit of the next billion users goes. And for the most part, the people using these apps benefit. Snapchat stories are fun. Now you can have them in Instagram, too. Sounds good. Tweeting in the dark: The next big fad?